According to TransUnion CIBIL, the leading credit bureau of India, about 80 percent of loans are approved for individuals holding a score higher than 750. There are various factors that influence a credit score like – payment history, outstanding amounts, length of credit history, type of credits (secured v/s unsecured) and number of inquiries for new credit. More inquiries represent credit greedy behaviour and can have a negative impact on score. As you can see that new credit accounts for 10% of your CIBIL score. When any lending institution asks for your credit report from the respective credit agencies, an inquiry is registered. It is precisely due to this reason it is advised not to apply for any loans or credit services from different banks at the same time. Any new credit will trigger a CIBIL query which will reduce your credit score by upto 5-8 points. Today in this post we are going to clear the air around credit inquiries for good so that all your doubts are put to rest. 1 Can a CIBIL inquiry affect your credit score? 2 What is a hard query? 3 What is a soft query? 3.1 Will checking my CIBIL score on Wishfin affect my score in any way? 4 Is there any way to restrict/curtail the number of hard queries? Can a CIBIL inquiry affect your credit score? Well, it depends on the kind of inquiry. Basically there are 2 types of inquiries which are factored in your CIBIL report – Hard and Soft. Only a hard inquiry can affect your CIBIL score. Lets have a look at how the inquiry section looks like in a credit report. 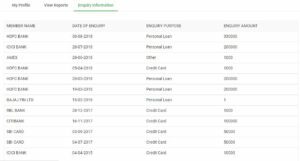 Metrics like date of inquiry, purpose and amount is clearly mentioned in the inquiry report along with name of the lender that pulled out your CIBIL report. What is a hard query? When you apply for credit cards or loans, the lenders get the permission to go through your credit score and report after pulling your data from the credit bureau. This is considered as a hard query. Basically whenever you are seeking credit, the lender pulls your credit information and this is considered as a hard inquiry. Another point to be noted is that every hard query diminishes the credit score of the concerned person by 5-8 points. What is a soft query? When you want to know your credit score and you are getting the CIBIL report either by yourself or via any official CIBIL partner then this kind of query is termed as a soft query. It does not affect your CIBIL score in any way and so you can keep a track of your credit activities by regularly going through your credit report without any fear. 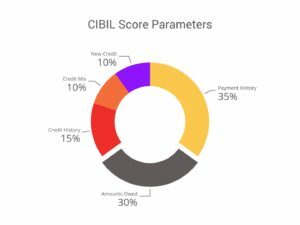 Will checking my CIBIL score on Wishfin affect my score in any way? Absolutely not! You can check your CIBIL score and report on Wishfin without having to worry about any kind of point loss. This is because Wishfin is an official TransUnion CIBIL partner and so when you check your CIBIL report, you will not loose any points. Is there any way to restrict/curtail the number of hard queries? The best way is to stay informed about your CIBIL before applying for any type of new credit. This way you will know beforehand about banks that won’t have any problem in passing your credit application. In case your CIBIL comes out to be low, you can always work and improve it as per your credit requirement.